At the launch of NICHE, Daniel announced he wanted five regional, rural and/or remote Australian communities to apply for him to spend a week in their community helping them find better ways to challenge homophobia and support local LGBTI people. Daniel’s time for these five weeks will be free. Daniel is happy to go to new places, or return to those places he visited during the original Beyond ‘That’s So Gay’ Tour. All you need to do is answer the questions below and send it through to: niche@thatssogay.com.au. More information on the timing will be negotiated with individual communities. * What is life like for LGBTI people your way? * How could having Daniel Witthaus for a week make a difference where you live? * What opportunities could be taken advantage of during the week? 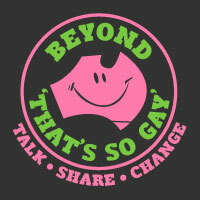 See www.thatssogay.com.au for ideas (e.g. ‘cuppas’ with locals, story collection, training, media, presentations, etc) Please list. * What challenges might be faced to make this week a success? We look forward to hearing from you all. This entry was posted in Uncategorized on March 18, 2013 by Dan.